Peonies are spring perennials that grow in almost any climate, from cold northern regions to warm areas of the South. They produce large, showy blooms on stems that can reach a height of 3e feet. They can also grow and spread to a width of 3 feet. 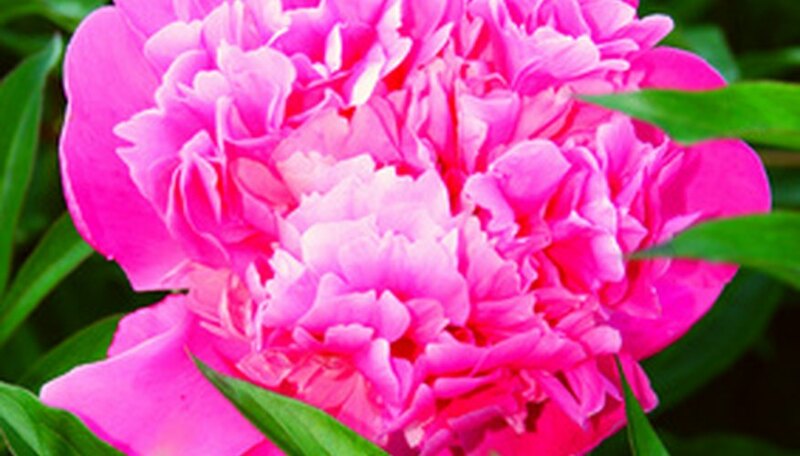 The beautiful peony flower is top-heavy and can weigh down the stems, causing them to break off. For this reason, you may want to stake your peony plants. There is no need to purchase an expensive support or to take hours out of your day to build a special one. Peonies can be supported with a basic, cone-shaped tomato cage. Buy a large tomato cage from a home and garden center. When it comes to staking peonies, the wider the tomato cage, the better. Stake the peonies as soon as they begin emerging in the spring. Clip the bottom ring off the tomato cage with wire cutters. Make the cut on the top edge of the ring, so that when you cut it off, there will still be three wire post legs at the bottom of the cage. The cage will just be a bit shorter. Bend the bottom post legs so they point straight down. Insert the cage over the peony plant, pushing the wire as deep into the ground as you can. Try not to damage any of the peony roots. If you have a narrow patch of peonies, you do not have to cut off the bottom ring of the tomato cage. Simply bend the bottom posts out straight and insert it into the ground as is. If you don't put the cage support over the peonies as soon as they begin emerging in the spring, you run the risk of damaging the flowers and stems if you try to support them once they begin to grow. Which Peonies Can Grow in Zone 9?